River Clean Up chairman Russell York (dog is sniffing his knee) is seated in center of photo. 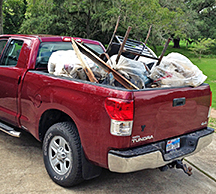 Truck load of trash from the north region. The Clean Team at the north end collection site (Hanson Riverside County Park) consisted of Evans, Naglers, Funks, McDonald, Dunham and Ronayne manned two boats and three jet skis to pull a truck load of trash out of the river from the salt water dam down to the Phillips 66 barge terminal. 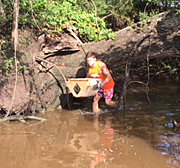 Blake Daniels slogs thru the river mud.